How to manage the lawful basis for processing data in OnePageCRM? Explicit Consent: The data subject has freely given consent for their information to be processed for a specific purpose. Performance of Contract: Processing is necessary due to the fulfillment of a contract. Vital Interests: Processing is necessary to save or protect an individual’s life. Public Interest: Processing is necessary to perform a public interest in official functions. Legitimate Interest: Processing is necessary to the legitimate interests of an organization or an individual. GDPR requires a data controller to keep a record for each contact stored of which lawful basis applies for your data processing. In OnePageCRM, you can manage this by setting up status labels, custom fields or lead source and adding a lawful basis for processing your contacts' data. 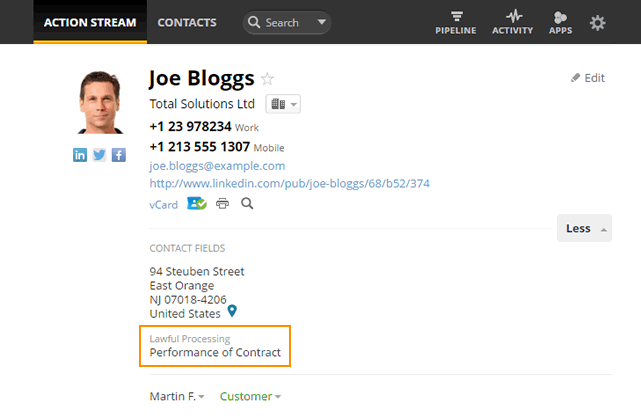 Below is an example of a custom field in OnePageCRM.